COMPILE60 is a simple front-end I wrote in Python/Tkinter to simplify C compilation and linking of PC-6002 projects. COMPILE60 requires z88dk to work and of course a PC-6001 emulator to run the binaries. 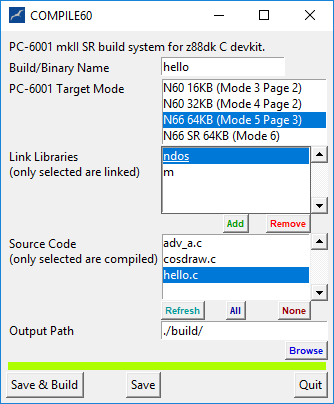 At the moment, N66 SR (Mode 6) support is listed but it doesn’t exist in z88dk yet (working on it).